Ada Melissa Morgan was born in 1886 and she married Daniel H. (Dee) Radford in 1906. Dee Radford was born in 1881 in Leamington, Utah and died 1951 in the Shelton area of Idaho. Ada was a daughter of William and Lovina Morgan and Dee was a son of Daniel H Radford and Everal Hannah Morgan Radford. 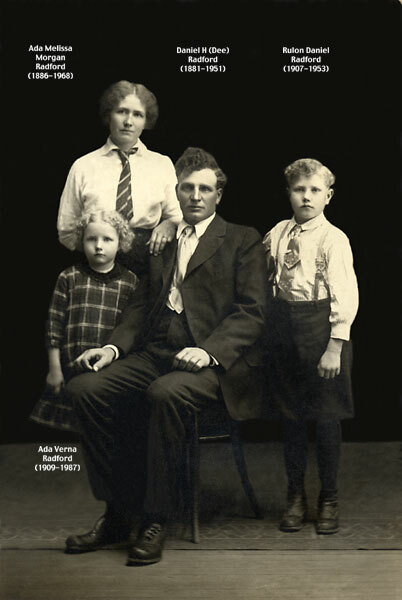 The children in the picture are, standing, right; Rulon Daniel Radford, born 1907 at Neeley, Idaho, died 1953. Standing, left, Ada Verna Radford, born December 2, 1909 and died in June 1987 in Caldwell, Idaho. She married Glen Montague in 1927. They had 5 children, one of which, Verna Alleene Montague Morgan married Chester Earl Morgan (1916-1999), one of George William Morgan's twin sons. Click on the link above to be taken to a page for Bernice Radford Bergeman. Click on the link above to be taken to a page for Don and Helen Radford. The destinys of the Morgan and Radford familes was linked across the Thomas Morgan and William Thomas Morgan generations. 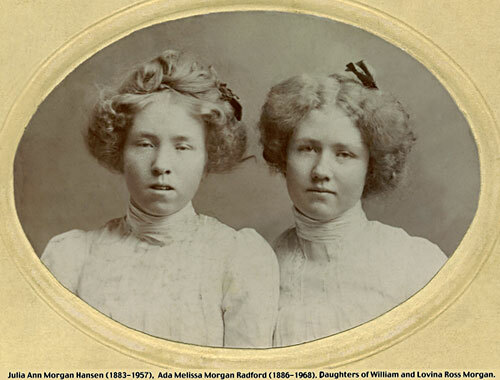 Julia Ann Morgan (Left) (1883-1957) and Ada Melissa Morgan (Right) (1886-1968) were daughters of William and Lovina Ross Morgan. Ada married Daniel H. (Dee) Radford in 1906. Julia married Rasmus M. (Rast) Hansen in 1913. Click on the link above to see a studio portrait of Daniel H. (Dee) Radford and his younger brother James William Radford when they were young men. Click on the link above to read a life history for Ada Morgan Radford and her husband Dee Radford. Click on the link above to see a large picture of Ada Morgan Radford in a group of women in the Shelton, Idaho ward taken in the 1940's.